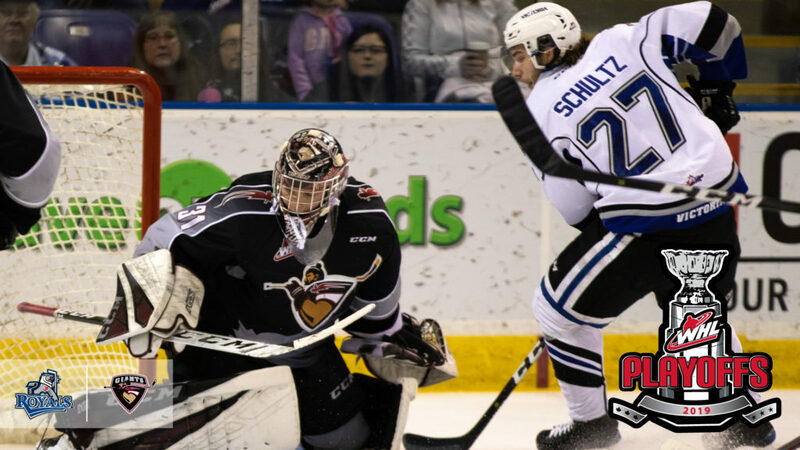 The Vancouver Giants and Victoria Royals will renew their geographical rivalry for a second-straight season when they meet in the second round of the 2019 Western Hockey League Playoffs. Both teams have seen their top offensive options of last season move on in the likes of Tyler Benson, Ty Ronning, Tyler Soy, and Matthew Phillips, but there’s still plenty of reason this series could go the full distance with plenty of flair as well. After playing to seven games last season in the playoffs, the regular season series was another battle. The Giants ultimately won that 10-game battle with a 6-2-1-1 record, but the Royals were right on their heels with a 4-4-2-0 record. Overall, six of the games in the season series were settled by a single goal with the final two games settled in a shootout and overtime. In addition to being named the WHL McSweeney’s Player of the Month for March Monday, Giants’ forward Davis Koch led all players with 14 points (3G-11A) in 10 games. 2019 NHL Draft prospect Bowen Byram has impressed all season and was one of three Giants to finished tied for second in the season series with eight points. This series could be one where Byram’s potential shines to further strengthen his draft stock. D-Jay Jerome had five goals and seven points in the season series to lead the Royals against the Giants. An offensively-minded rear guard in Scott Walford (Montreal Canadiens) had five points (1G-4A) to finished in a three-way tie for second in scoring on his team. As much as the Giants will rely on Byram, so too will the Royals rely on a defenceman like Walford. In net, this series should be an absolute delight. The Giants rolled with the tandem of David Tendeck (Arizona Coyotes) and 2019 NHL Draft prospect Trent Miner in the first round as each won a pair of games against the Seattle Thunderbirds. However, it was Tendeck who was in net for the majority of the regular-season series, sporting a 4-1-1-0 record, 1.80 goals-against average, a .921 save percentage, and a shutout. Opposing them will be the legendary Griffen Outhouse, who is poised to be a leading defensive force for the Royals once again. In the regular season series, Outhouse posted all four of the wins for the Royals while maintaining a 2.50 GAA, and a .925 SV%. With 114 wins in his WHL regular season career and 12 more in the WHL Playoffs, including four from last year’s meeting, he’s been the team’s constant in the blue paint. He’ll have his eye on more success in the coming series against Vancouver. Game 1 of the series will take place Friday, April 5 (7:30 p.m. PT) at the Langley Events Centre as the Giants will look to continue their home-ice advantage. After Game 2 Saturday, the series will shift to the Save-On-Foods Memorial Arena in the provincial capital starting with Game 3 on Tuesday, April 9 (7:05 p.m. PT).